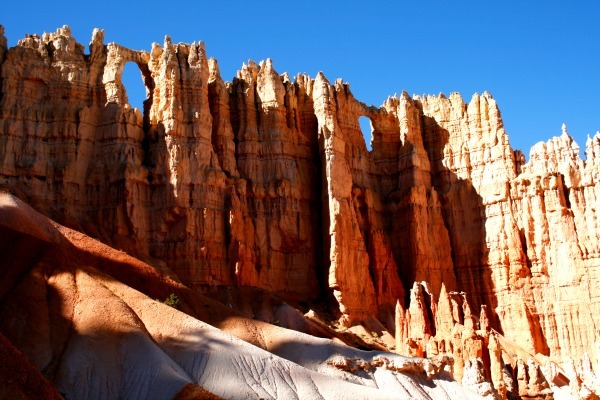 A late summer camping trip to scenic Bryce Canyon and back home through Escalante Utah. Neither of us had been to Bryce Canyon, we decided it was time to go camping there. Since we had five days off, we left southwest Colorado right after work, opting for the quickest route to get there. A view from Bryce Point. 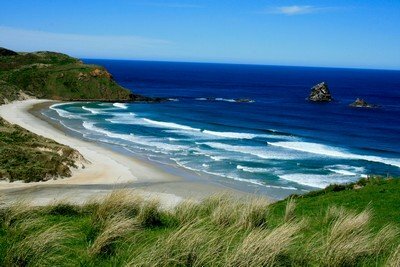 We figured that spending two days in the area, hiking and sightseeing would be plenty. 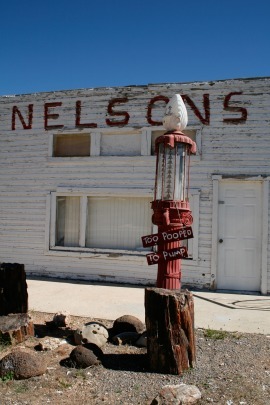 After that we would take our time and head back home at a leisurely pace and stop at interesting places along the way. Bryce Canyon was nothing short of amazing, but it wasn’t the only spectacular place we visited on our trip. 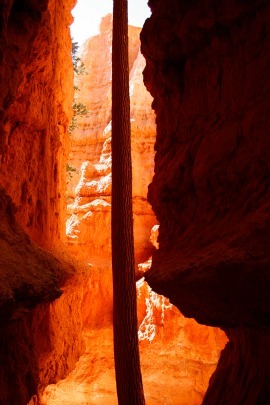 A walk between the pillars on the Navajo Loop Trail. Our first place to camp was at the State Park in Green River, Utah. We got there late. Although we didn’t spend much time there, it’s a nice place which offers nice facilities. Located in the center of town it offers nice bathrooms, hot showers, big trees, green lush grass and close proximity to the Green River. The surprise 4 a.m. freight train made for a great alarm clock. Since we were awake at that point, we figured it was a great time to get an early start and continue on to Bryce Canyon. We arrived at Bryce Canyon before noon. Being September it was still crowded, luckily most people were not there to camp. At 8000ft, the nights were cool at about 32 deg F (0 deg C). We camped at the North Campground since the Sunset Campground was already closed for the season. North campground is open all year and offers full facilities: Showers, laundry, general store with groceries. Yes, you do need to reserve a campsite at least 2 days in advance most of the time! Access to the canyon rim is close and we even went hiking on the Fairytale Loop Trail from the campground. The Sunset Campground, one mile away, offers close access to the nicer views of Bryce Canyon. It is a first come first serve campground is and closed from September to May. Planning to do some hiking? We really enjoyed the Peek-a-boo Loop Trail! We hiked it from Bryce point but it may be better to leave from Sunset point and combine it with the Navajo Loop Trail. 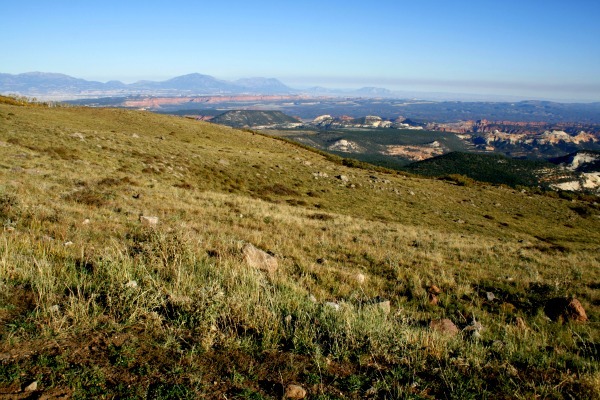 Both trails offer incredible geologic scenery! It gets surprisingly hot between the rock pillars mid-day. Take water, even if you plan only a short hike. There is no water available anywhere once you leave the top. Since the hike goes downhill first, it's difficult to notice the length and steepness of the trail. On the third day we left Bryce Canyon early in the morning and headed east on hwy 12 to Cannonville. From there we headed south to Kodachrome Basin State Park. I’d say that if you’ve already traveled so far this park is worth the extra time to see. For such a small park there a many interesting geological features to see. Be sure to check out Shakespeare Arch and the Sentinel. At night the starry skies are amazing as well! The campground is excellent too, even had showers and by far more peaceful compared to any National Park Campgrounds. 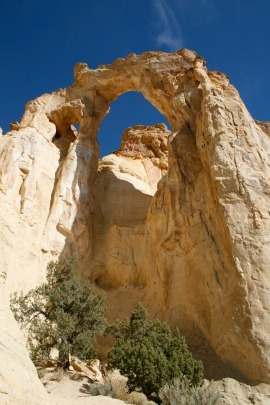 We often prefer the solitude of these smaller places compared to popular places such as Bryce Canyon. The dirt roads around Kodachrome State Park are accessible with normal 2WD vehicles. Once you continue on from Kodachrome Basin to the Grosvenor Arch you may need a 4WD, especially if it rains or even if there a storm clouds nearby. There is a deep wash you’ll need to cross immediately after a 35 MPH sign. Watch out for that one, especially if you happen to be driving 35 MPH! It comes up fast. The Grosvenor Arch is interesting to see but it’s a long way to go on a rough road. I didn’t see any suitable areas to camp since the road passes through lots of private ranch land. After returning to hwy 12 our next stop was Escalante. If you ever decide to travel through there, a stop at the Esca-latte Café’ & Pizza Parlor is a must. It’s next to the Escalante Outfitters Shop. I’m a fan of great specialty coffees, fresh micro brews & pizza and this place offers all three. If you get there at the right time you may be able to find a place on their deck outside. A nice place to camp is Escalante State Park. It’s a nice clean campground, cleaner than some motels we’ve been to. The area has some great colorful scenery, and if you’re an avid hiker there are plenty of trails to choose from. One word of caution however, it’s best to have a 4WD to access many of the trailheads since some of the roads get really rough. The one-lane bridge in the top of Hell's Backbone loop. A worthwhile scenic thing to do is drive around the loop over Hell’s Backbone, which is the old road before hwy 12 was built. There would be some nice places available up there to go free camping, primarily on the west end of the road between the one-lane bridge and Escalante. The golden aspens along the way made the trip a colorful one for us. Any vehicle can make that trip. At the highest point you'll get a great view from hwy 12. There are great camping spots up there too. Once you continue east of Escalante on hwy 12 to Torrey Utah and Capitol Reef the road gets interesting. There is an area called the “Hogback” where the road goes along a razor sharp ridge for many miles. 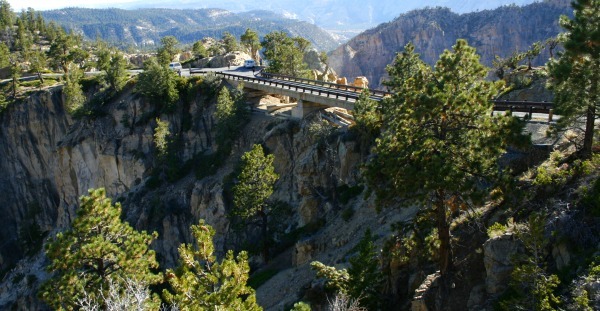 The road goes up over 9,000 feet, sharp curves with steep grades and you can see for miles in every direction. Having been on that stretch of road several times, it’s still one of the most spectacular roads we’ve ever been on! 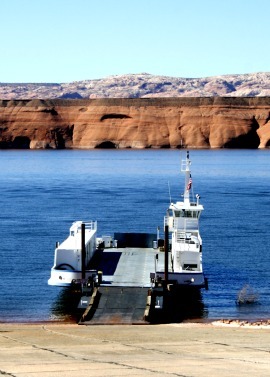 The Lake Powell crossing with the Ferry. From there we decided it would be fun to head down to the Lake Powell and take the Ferry across to the other side. We did get lucky though, being so late in the season the ferry only crosses once a day and we got there just in time and there was room for us. The alternative would have been a 120 mile detour! 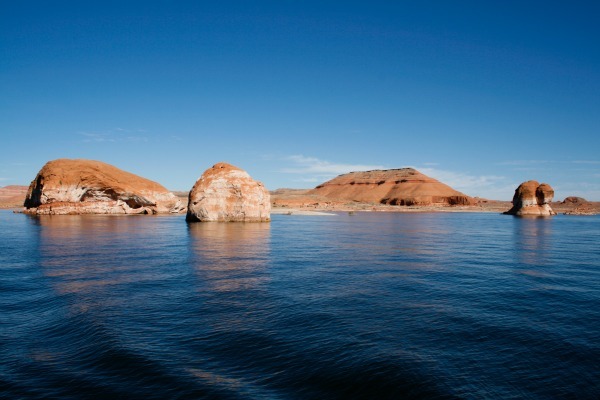 A view of Lake Powell from the ferry. Something to note about the Lake Powell Ferry from Bull Frog Marina to the Hall's Crossing Marina. The ferry is used as a highway 276 connector. Sometimes the ferry doesn't operate at all. Sometimes maintenance is being performed. It's always best to call for information right before you plan to cross the lake at (432) 684-3088. 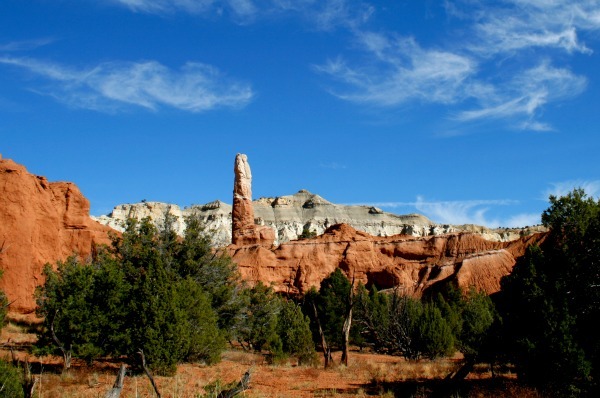 Besides Bryce Canyon, there are many other things to see. On the southern road from Lake Powell, hwy 276, heading towards Natural Bridges National Monument, there are some great places to free camp in remote desert areas once you get to the bluffs. There are many side roads leading to potential free campsites. We really enjoy the campground at Natural Bridges National Monument but it’s a first come first serve campground with only a few sites available. It’s been years since we’ve managed to get there early enough to get a site. This was the final leg of our Bryce Canyon Camping Trip. From Natural Bridges National Monument it’s a quick trip back home to Colorado. 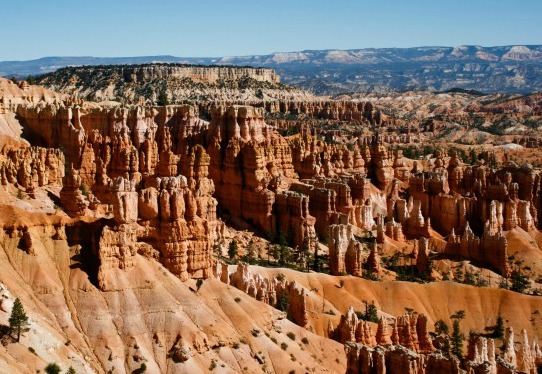 Click here to go back to the camping trip ideas page from the Bryce Canyon camping trip page.